This technology is obviously beginning to work out. Going to a purposed vehicle is the obvious next step as the retrofit model clearly expands difficulties. I see three massive markets for this technology. The passenger car is the one we all want, but right behind that we have the long haul trucking industry which is dependent on biologically over extended human beings. That needs to end and not for the cost saving. All this leaves the problem of foul weather conditions to overcome, but believe it or not, a modest reduction in speed does wonders for vehicle handling without seriously damaging schedules. This was never possible for the human driver simply because he is only good for a limited time frame. A computer can simply run the extra several hours. The third massive market will turn out to be the airship hauling container traffic. The problem with that business plan has always been the need for manpower. Make that disappear and long haul trucking is toast. The airship is faster and lacks running vibration as well. Better, it is a point to point delivery system. 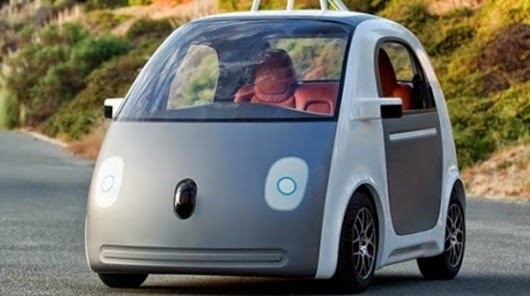 Google has revealed its first self-driving car prototype, which as you guessed requires no driver. The prototype accommodates for two passengers and is missing quite a few of the features you'd expect to see in a standard car. With no need for a steering wheel, mirrors or braking and accelerating pedals, the car comes fully equipped with special software and sensors that feed information into an onboard computer, which then drives the car. Google has been experimenting with autonomous driving technology since 2010, which allows cars to drive themselves. In the past the company has experimented with retrofitting ordinary cars with video cameras and radar sensors, linked to a detailed mapping system, which allows the car to navigate through urban streets and traffic without the assistance of a driver. Now the first completely new build self-driving prototype has been developed. Focusing on safety, Google's self-driving prototype features sensors that can "see" beyond blind spots and detect other vehicles, objects, pedestrians and landmarks within a 360 degree radius that spans approximately the length of two football fields. "In a normal car there’s power steering and power brakes, and if the power steering fails, as a strong person you can use your muscles as a fallback to still steer the vehicle", Google's Chris Urmson told re/code in a recent interview. "In our car there is no steering wheel so we have to design really fundamental capabilities. So we have effectively two motors and they work so if one of them fails the other can steer, so the car can always control where it’s going, and similar with brakes." The car also features collision protection for both its occupants and pedestrians, including a foam exterior and flexible windshield. During the testing phase of this new technology, Google has capped the vehicle's maximum speed to 25 mph (40 km/h) in order to minimize any potential danger. The interior of the vehicle has also been kept simple and practical for testing purposes. There are two comfortable passenger seats, with seatbelts and spacious leg room; a small storage compartment, stop and start buttons positioned in the center console and a navigation screen displaying the planned journey. Google has plans to build a further 100 self-drive cars within the year, with safety tests to commence over the (Northern Hemisphere) summer. "If all goes well, we’d like to run a small pilot program here in California in the next couple of years," says Google. "We’re going to learn a lot from this experience, and if the technology develops as we hope, we’ll work with partners to bring this technology into the world safely." Check out the new Google self-driving car in the video below.